In US Dollar, Cart included. Since opening in the spring of 1998, Arrowhead Golf Course has been known as the course to play for golfers of all types. Beautiful designed by noted architect Gordon Lewis, Arrowhead features 18 picturesque holes positioned amongst sixteen pristine lakes and rolling fairways. With spacious greens and wide landing areas, Arrowhead is friendly to high handicappers, however, better golfers will find the many well-placed bunkers and water hazards a real test of their skills. With four sets of tees, the course allows for play at many varying degrees of difficulty. Located just 1.7 miles east of I-75 (exit 17) on Immokalee Road in Heritage Greens. The 18-hole course is actually two golf clubs in one. The front nine comprises the Pelican Marsh Golf Club, a contemporary design which accents bold mounding and bunkering as well as elevated tees and greens. The back nine is the Bay Colony Golf Club, a traditional rolling links course that takes advantage of its natural terrain features. One of the top ten private courses. Each of the nines is a different challenge, the front nine's spacious fairways and natural bunkering give way to the forested back nine's layout. Tom Fazio's design will delight novice golfers, while more seasoned players are challenged to swing for the pin, and sub-par scores, on nearly every hole. Gordon Lewis newly designed 18 hole executive course that offersa fun, enjoyable round for golfers of all levels. Home of southwest Florida Wowen's Golf Association and Dee Laughlin School of Golf. One mile north of Bonita Beach, one mile east of US 41 on West Terry Street. Take US 41 to West Terry Street, turn east exactly 1 mile. Tee times 7 days in advance. For beginners. You can walk any time! Electric carts available. Beach Hotel & Golf Club, Naples, 851 Gulf Shore Blvd. Boyne South, 18100 Royal Tree Pkwy. Nestled perfectly amongst towering pines and cypress trees lies South West Florida's newest 18 hole championship layout - Cedar Hammock. The pristine cypress and pine preserves provide the beautiful framework for this gracious new golf course. This 18 hole layout tips out at over 6800 yards but with 5 sets of tees golfers of any level can comfortably challenge this course. Cedar Hammock's highlights include: A large practice green, chipping green with a bunker, and a large practice tee; USGA greens with the new TIFEAGLE Bermuda grass that will provide smother, faster, and truer putting surfaces; Numerous glimmering lakes and pristine tree-lined fairways that visually challenge but rarely impede your round. The Brooks is a 2492-acre master-planned community developed by Bonita Bay Properties. Copperleaf Golf Club is a newly completed par-72, 18-hole golf course designed by architect Gordon Lewis. Five sets of tee placements offer distances from over 7000 to 4500 yards. The course features broad, rolling fairways and gently sloped tif-eagle greens. Water and waste bunkers are sculpted into many of the golf holes to provide a memorable shot-making experience. A service-friendly staff and the Bonita Bay standard of attention to detail combined with beautiful surroundings make it a fun course for players of all skill levels. Located off Davis Blvd, Corner Santa Barbara Blvd. The exclusive, private 18-hole par-72 championship golf course was designed by P. B. DYE. The community includes less than 400 homes, each with a view of the 6760-yard golf course, woods or preserve. Stately slash pine and bald cypress trees dominate the community's landscaping of native flora growing in the 176 acres of preserves and lakes. All the shots will be required to master this 18 from any of the five tees. Off Immokalee Road, 1.3 miles east of I-75 Exit 17. An abundance of virgin cypress stands, yawning sand bunkers, sparkling lakes and pine forests, provides a breathtaking backdrop of Florida's natural beauty. This championship course runs the gamut from the tantalizing third ot the monstrous 18th. Called "The Thinker's Paradise" because of the variety of shot making skills required, Cypress Woods is challenging yet very playable. Off Immokalee Road, Exit 17, just east of I-75 to 1st left, 1 mile north on Northbrooke Drive. The 6909-yard championship golf course is rated among Florida's best, and the limited membership keeps the course uncroweded. Eagle Creek is located on CR 951, just south of US 41, midway between Naples and Marco Island. Boyne South is a sister resort to the renowned Michigan golf courses. Abundant water hazards and pristine wildlife make the golf eyperience at Boyne South unparalleled in Florida. To insure that the players enjoy the course, Boyne South features the YARDMARK yardage system. Boyne South has also added a new driving range and practice facility. Instruction is available through a qualified P.G.A. teaching staff. Restaurant opened daily in season for lunch & Sunday brunch. I-75, New Exit 101, on CR 951 south to US 41, left on US 41, approx. 5 miles. Call for tee time: (239) 732-0034 Ex-2. Look for coupons in NAPLES TIMES. Recommended only in the "cold" season. JP. This remarkable Gordon Lewis design features ample landing areas, accessible greens, five sets of tees, large lakes, and a large, convenient practice-range. With yardages ranging from 5555 to over 7000 yards, this jewel will challenge the top-notch player, while offering the recreational golfer an enjoyable round. With holes framed by a mature pine forest and areas which will remain untouched by development, Forest Glen provides the golfer with a feeling of solitude while on the golf course. One of the best private courses in Naples. High quality. An 18-hole course for beginners. For the discriminating golfer who prefers a challenge, this 18-hole semi-private course provides challenge and enjoyment to players of all abilities. The championship facility creates a ribbon of greenery almost four miles long winding through the beautiful and tranquil community. The course is open to the public. Located off Davis Blvd, North of County Barn Road. Tee time 2 days in advance. Rangers will use flags when slow play. Tee time 2 days in advance. Golden Gate Country Club, Naples, 4100 Golden Gate Parkway. Exhilarating is the word most often used to describe Grandezza Golf Club's 18-hole championship golf course. Five sets of tees, undulating greens, rolling fairways and significant elevation changes all combine to make this Darwin Sharp III design one of the most challenging in Florida. Located: Interstate 75, Old-Exit 19 East. North on Ben Hill Griffin Pkwy. Two 18-holes championship golf courses. Located Airport Road, north of Golden Gate Parkway in Naples. A "tropical jewel" in the paradise of Southwest Florida most appropriately describles Hammock Bay Country Club. In a natural setting, neatly blended against the native mangroves and waterways of the "Ten Thousand Island," wildlife is abundant. The course, with its well-bunkered greens and wide fairways, was designed by the architectural team of Bruce Devlin and Bob Von Hagge in 1975. Gene Sarazen served as honorary chairman of Hammock Bay Country Club. He also provided the inspiration for much of the architectural design inherent to the golf course. "Hammock Bay," Marco Island's closest public golf course, is a perennial favorite among residents as well as guests. As with all fine courses, proper dress code is strictly enforced. From Naples take US 41. Turn right on CR 951 towards Marco Island. 4.5 miles to traffic light, turn left on Mainsail Drive, 1 mile to clubhouse. Tee times 5 days in advance. Paradise Golf School. Surrounded by nature, ...not condos. Naples Heritage Golf & Country Club, a US Home Community. Come experience Naples' newest golf sensation! Designed by noted architect Gordon Lewis, Naples Heritage is really a golf course/preserve. The holes are virtually carved out of a forest of pine and cypress trees. Pristine lakes provide mirror images of this unique championship course. Five sets of tees make Naples Heritage both challenging and entertaining for all skill levels. Wide fairways coupled with well-placed bunkers and perfectly manicured greens. inspire the golfer to return to this natural setting for another enjoyable round. 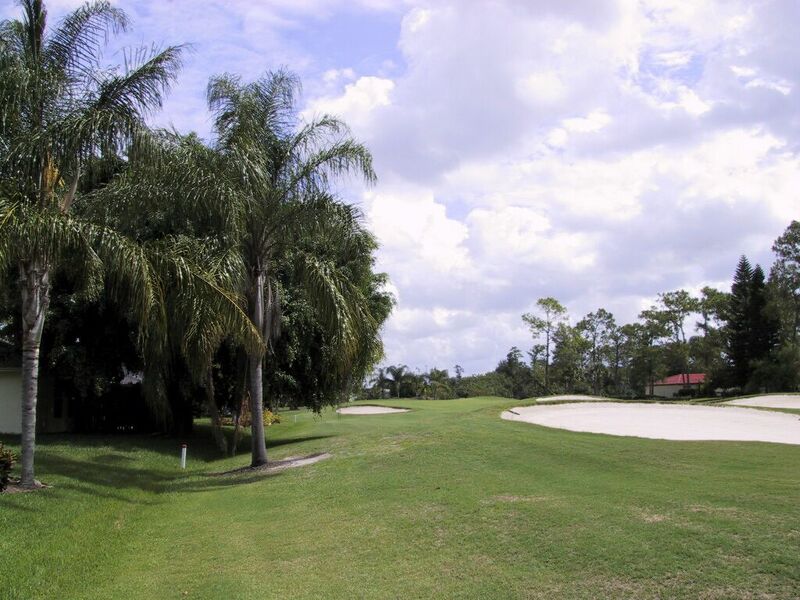 Conveniently located off I-75 and Davis Blvd, Naples Heritage is a golf experience you must not miss. On Davis Blvd, between St.Barbara and CR 951. Heritage Bay is one of the finest golf facilities in the Southwest Florida area with 27 holes of golf that have dazzeled golfers since November 2006. The facility is located on Immokalee Road in North Naples, 1.3 miles east of Collier Blvd (SR 951). Regarded by many as the "Place to Play in Naples", Hibiscus is a favorite for both tourists and locals. There is a fully stocked pro shop, in addition to lesson, which are available from PGA qualified professionals. A panoramic view of the course from the restaurant and lounge provides a fitting beginning and end to an enjoyable day of golf at Hibiscus Golf Club. 20% OFF if you buy a monthly discount card for $100 ($150 for a couple). Where? Go on US41 East turn on Rattlesnake about 1/2 mile. 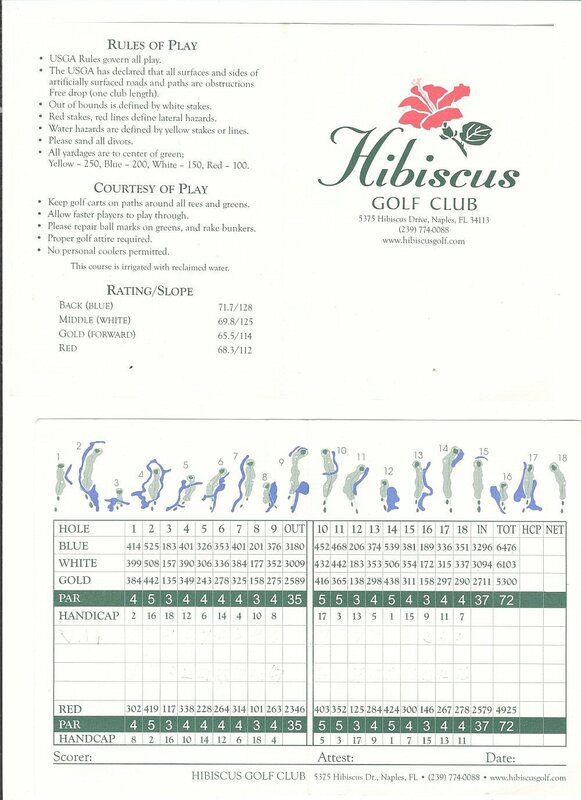 Hibiscus Golf & Country Club is a semi-private facility located in the northwest corner of Lely Estates in East Naples. Built in 1969, this splendidly conditioned layout is one of the few golf courses open to the public in Southwest Florida. Hibiscus Golf & Country Club is a golfer's dream, with 18 totally different experiences for both the high and low handicap player. Wide fairways, well, bunkered greens, and numerous lakes and streams makes each hole a new challenge and a pleasure to play! A unique course at which Scrub Oak hammocks, giant water oaks, native Florida slash pine and plenty of palms thrive in a lush environment. The course offers high standards of maintenance, good length for high handicappers along with five sets of tees to keep the game fun for all. Highlands Woods was designed by architect Gordon Lewis and is fast becoming a south Florida favorite. Tee times 2 days in advance. Designed by locally renowned golf course architect, Gordon Lewis, and surrounded by lush tropical vegetation, Hunters Ridge Golf and Country Club's 18-hole championship par-72 golf course is set amid 275 pristine acres, with breathtaking views of sparkling lakes and natural preserves. Ranked as one of the top 15 distinctive development courses in Florida by GOLFWEEK magazine, the course offers a challenge for players of all skill levels. This exquisitely-maintained course features tree-lined fairways and an abundance of natural wildlife, making it one of the most beautiful and challenging courses in Southwest Florida. I-75, Exit 18. Red Stakes with Green Tops are NO ENTRY PRESERVE AREAS. Private 18-hole courses. West course. Private 18-hole courses. East course. Kensington is a thinking man's course designed by Robert Trent Jones, Jr. Superbly maintained with a multitude of challenging holes. Multi-level tee positions, contoured fairway bunkering and rolling fairways. Play is also available to TEE TIMES USA customers at this exclusive member's only club that is one of Naples' finest. One of the finest clubs in Naples. JP. Naples Lakes Country Club is a new Arnold Palmer Signature Golf Course set amid sparkling lakes and a 160-acre natural preserve. The course layout incorporates the natural surroundings, featuring several peninsula tees/greens, an island green, generous fairways and strategically placed bunkers to test the skills of every level of player. The precisely contoured and undulating greens are certain to be challenging and memorable. With 4 sets of tees ranging from 5073 yards to 6804 yards, this perferct union of nature and course design will provide players the ultimate golfing experience. Sometimes it is open for the public even in winter - you have to ask! Designed and built by world-renowned golf course architect Robert Trent Jones Sr., the Lely Flamingo Island Club is Naples' only signature public golf course. GOLFWEEK has twice designated the course as one of "America's Best", while GOLF DIGEST gives it four stars. With its hourglass fairways, fingered sand bunkers and large undulating greens, the golf course is destined to provide many exciting challenges. The picturesque par-3, fifth "Flamingo Island" hole is absolutely unforgettable. For those seeking professional instruction, the Lely Flamingo Island Club is also home of Doug Higgins Golf Academy. SOUTHERN LINKS magazine quoted golf legend Gene Sarazen as saying, " The Lely Flamingo Island Club is the best in Naples." Play it for yourself - we're sure you'll agree. A must to play, best public course in Naples. JP. Lely's Mustang course is a legend in the making. Designed by Lee Trevino, Mustang Golf Course is a layout that follows his philosophy of making the game challenging - but a fair challenge - for the average golfer. The course offers a variety of golf holes that are difficult to a point, but always fun in play - this is a place where a player can always recover from an errant shot. Punctuated by twelve sparkling lakes, the Mustang gently flows across undulating fairways and winds through stands of towering Florida pines. Strategically placed bunkers will test your decision-making prowess as well as shotmaking abilities. Come play this most forgiving course - you'll want to come back and play again and again! Long, long, long, but not so nice like Flamingo. JP. Lely's The Classics is the private course while two other courses are public. The Links of Naples is the finest executive layout in the area. This 18 hole, par-61 challenging layout measures 4200 yards and offers several par-4 holes over 300 yards. Elevated, well-bunkered greens, well-mounded and multiple tees make this layout challenging to all players. Links of Naples is unique to the area since it is the only LIGHTED golf course in Naples. It is lighted every night until 11 pm, and includes a lighted aqua driving range. Located on US41 between CR-951 and CR-92. Nice and easy to play, you'll enjoy it with your family. JP (72 gold). It's only 10 miles from WINTERPARK. Marriott's Golf Club at Marco Island, 400 S. Collier Blvd. Marco Shores, Marco Island, 1450 Main Sail Dr.
Miromar Lakes Beach & Golf Club, 10160 Miromar Lakes Blvd East, Miromar, (239) ? Originally constructed in the 1920's, this course is the host of numerous national and state professional and amateur tournaments. The Watkins Family purchased the golf course in 1946 and oversaw its redesign by Ron Garl in 1979, 1993, and 1998. Located off Gulf Shore Blvd. Read course rules! Architect: MICHAEL J. HURDZAN, PH. D.
Old Corkscrew Golf Course was given the BEST FLORIDA GOLF COURSE AWARD in 2008. The Old Corkscrew Golf Course is located on Corkscrew Road, 7 miles east of I-75. Palm River "La Playa" Country Club is a private golf course located in Palm River Estates in North Naples. One of Naples' oldest golf courses, Palm River offers a challenge to golfers of all skill levels. As one of the few golf courses open to the public in Southwest Florida, this superbly conditioned layout is a favorite among many native Floridians. Palm River boasts a fully-stocked pro shop, and its clubhouse has an acclaimed restaurant and cocktail lounge which also are open to the public. Give them a try after your round of great golf. If they have good rates you should play it. JP. Share the championship experience of golf played on a Gordon Lewis masterpiece at the area's newest and most scenic golf layout. Created with dramatic signature holes and designed to ultimately offer three separate nines, the course is a stunning layout, satisfying golfers of all skill levels from five sets of tees. Experience all you expect in a truly challenging Florida course_ lush tees, greens, fairways and roughs plus water, sand, mounding, waste bunkers, abundant palms and wildlife and more. Complete practice facilities include putting green, chipping green, practice bunker and range. The club is conveniently located two miles east of Interstate 75 on Bonita Beach Road (exit 116). 2 miles east of Interstate 75 on Bonita Beach Road (exit 116). Located on Immokalee Road east off I-75. The greens run true on both courses. The West course is the longest and most difficult of the two, while the East course calls for accuracy. The West course has water on every hole and will be a challenge to all. Southwest Florida's Top Ten course in the USA. Distance measured by Prolink Satellite Yardage Network. Play a Round at The Sound, that's the motto of this Golf and Country Clubs. This is the second course of the 27 holes. This is the third course of the 27 holes. Pelican Strand Golf & Country Club, Naples, 5645 Strand Blvd. Since 1981 Quail Creek, just north of Naples off Immokalee Road, has established a tradition of excellence, with two picture-perfect golf courses and a private club ambiendce unrivaled in the region. The Creek is a true test of power and skill from th long tees. The opening hole is a lakeside, 400+ yard par-4, the first of two 400-yarders in the initial six holes. Both par-5s on the front - the 510-yard fifth and the 542-yard ninth - require three shots of reach the green. On the 528-yard 17th hole, a meandering stream must be crossed twice on the way to the clubhouse. The second course is the QUAIL course. The Quail Course measures but 6233 yards from the blue tees - a relatively short course by most contemporary standards, but not a layout to be taken lightly. Arthur Hills has done some of his best design work here. The front nine par-5s - the 500-yard first and third holes are very challenging. The par-4s are generally shorter than on the Creek course, but many are tight doglegs placing a premium on accuracy off the tee. Classic, open design with wide fairways and large,, receptive greens, this course provides an opportunity to shoot fairly low scores. Extremely well conditioned with water on only 5 holes. Great "Grip and Rip" tract. Located off CR 951 corner Golden Gate Pkwy. Lighted Nite Driving Rang. 20 tees driving range. New in 2007. JP. With 18 holes currently open for play, Raptor Bay was designed in the spirit of golf and respect for the land, capturing the essence of nature at its best. With no residential sites on property, surround yourself in the beauty of nature and the tournament quality course conditions that give every player an enjoyable golfing experience. The fun place to play! 4500-yard 18 holes. Come experience golfing at its best. Nine and 18 hole fees. You can walk any time! Electric carts available. Located County Barn Road corner Rattlesnake. Carved from 240 acres of Southwest Florida cypress, palm and pine, The Golf Club at Marco issues the premier challenge to experienced and beginning golfers alike. Designed by renowned golf course architect Joe Lee, this 18-hole, par-72 championship layout has water in play on 15 holes. The Golf Club at Marco is also home to the John Jacobs Practical Golf School, named golf school of choice by GOLF magazine. Marco Island, Marriott's Marco Island Resort. Tee times 2 days in advance. Shadow Wood Country Club, Bonita Springs, (239) ? Spring Run reflects architect Gordon Lewis' love of the game. This par-72 championship course features five sets of tees for each hole. Practice facilities include an aqua driving range, pitching and chipping area and a large putting green. The clubhouse and dining room are open to the public 7 days a week for lunch and can be reserved for private functions. Traveling north, exit I-75 off Bonita Beach Road (Exit 18), and head west to US 41. The Brooks is located 7 miles north of Bonita Beach Road. Top 100 Instructor DR. JIM SUTTIE teaches there. Designed by Gene Bates, former VP of the Jack Nicholas design team, this course blends beautifully into its natural setting with lovely native plantings. Some of the best greens in the Naples area, well manicured fairways and water on 16 holes - so you'll want to play smart, using every club in your bag. Challenging and enjoyable experience amongst the creek beds and ancient gnarled oaks that have defined this part of Florida for centuries. The former name of this course was Southampton. Traveling north on Airport Road, on the left side between Vanderbilt and Immokalee Road. Challenge "The Shark" at Tiburon, where 27 championship holes of exquisite beauty await you. The course, designed by Gred Norman, is unique to Southwest Florida, with its stacked sod wall bunkers, contrasting coquina sand and the preservation and enhancement of exiting vegetation - all which create the ultimate resort-style playing experience. The course has no roughs and the turf is maintained at a fairway height of one-half inch. Tiburon is the site of a 1999 and 2000 U.S. Open Qualifier. Tiburon is also home to the nationally acclaimed Rick Smith Golf Academy. Golfers will delight in the ultimate challenge this course offers. Southwest Florida's only Five-Star Destination Golf Resort. Distance measured by Prolink Satellite Yardage Network. Rick Smith Golf Academy. The TwinEagles Golf and Country Club located off Immokalee Road (east off I-75) in Naples gets its unique name not from its two 18-hole championship golf courses, but also from its legendary designers: Jack Nicklaus and his son, Jack II. For each prestigious 18-hole course, memberships will be limited to 275. Members of TwinEagles will also belong to the renowned Jack Nicklaus International Golf Club. Valencia Golf Course has remained the most affordably priced public golf course in the Naples market. Its spectacular layout and high level of service has made it the "Must Play Course" of the area. Noted golf course architect Gordon Lewis has taken advantage of the property's pristine natural Florida beauty and carved a challenging course that takes into play sparkling lakes, lush stands of Florida palms, pines and cypress hammock preserves. Trees frame almost every hole on the back nine. The course iss amenable to virtually all skill levels. From the championship tees, power and accuracy are paramount, but golfers have a choice of five sets of tees to match their abilities with this fair test of golf. Located nine miles east of I-75 (Exit 17), on Immokalee Road, turn on Randall Blvd. One of the newer gems to have been built in the Naples area, the Vanderbilt Country Club, is a challenge from the word go. Located at the end of Vanderbilt Beach Road, eight miles from the ocean, it is indeed a scenic wonderland. The course was carved out of 150 acres of prime, Florida forest land. There's even a 40-acre nature preserve smack dab in the middle of the front nine. But in addition to all its idyllic beauty, Vanderbilt has teeth. A course in great design. North course, 18 holes. Vineyards' North Course is designed to test players both mentally as well as physically. Prevailing breezes make club selction challenging, thus the North Course plays longer than its total yardage might suggest. Novices and seasoned veterans alike will be tempted to go for shots that might be better suited to conservative play. I-75 exit 16, east 1/4 mile. South Course, 18 holes. Home of Senior PGA Tour events "The Challenge", Vineyards' South Course has garnered quite a reputation since it opened in 1988. Carving its its way through the Vineyards community, this course is lined with live oaks, jacarandas, and plenty of sable palms. Players will be tested not only by the winds off the nearby Gulf of Mexico, but by the small, undulating greens throughout the course. Here is an exceptional opportunity to join Southwest Florida's finest private golf club - West Bay Golf Club in Estero - and enjoy not only fantastic golf on Pete and P.B. Dye classic, but also a charming Beach Club on the Gulf of Mexico and a Sports Club with swimming pool, health facilities, aerobics room, tennis courts, cafe and clubhouse. At the heart fo Windstar Golf and Country Club is the TOM FAZIO-designed championship course, a superb 6750-yard challenge for players of every level. But the play at Windstar takes place off the course as well. Well, there is an attached Championship Golf Course, but don't hesite to visite only the driving range and huge putting green. You are invited as a beginner and you pay only for the range balls. Well, there is an attached 18-hole Golf Course, but don't hesite to visite only the driving range and huge putting green. You are invited as a beginner and you pay only for the range balls. Naples(239) 384-6380, 2135 Tamiami Trail North, Naples, FL 34102, Located on Tamiami Trail North, just north of Golden Gate Parkway. Fax: (727) 345-0287, Phone: (727) 347-6133, Toll free: 1-800-771-5863. Order the Golf Card "Regional Gulfcoast Edition" for USD 15 (+2 USD for S+H). It enables you to play over 190 courses for reduced prices from May 1 until October 31. Phone: (561) 655-4970, Toll free: 1-800-672-0882. Order the Golf Card Edition for USD 15 (+2 USD for S+H). It enables you to play many courses for reduced prices from May 1 until October 31. Call (239) 643-3121 for recorded message and pickup locations, Donations USD 15. During Summer Season you can play on several courses for less green fee if you own this card. Phone: (239) 642-2066. One call... play them all. Tee time advantages. Country Club Courtesy. Phone: 1-800-374-8633, International: (904) 439-0001, Fax: (904) 439-0099. Call weeks, even month before play for FREE guaranteed advanced tee times and updated rates. Hidden dares and secret challenges typity Florida golf. Here are a few tips to keep the ball where it belongs. Northern fairways, with softer earth and more give, accept divot shots gracefully. Our fairways don't. Go easy on the divots, or you'll rabbit hop toward the green. Your wrists won't like it much, either. Dry winter fairways are faster than summer fairways. Unlike the soft, bent grass of the North, the area's stiff Bermuda grass grabs the club face; consider using an extra club when hitting to the green. The ball sits low in area Bermuda grasses, not high like in Nothern grasses. Naples area rough tends to be rough - thick, tangled vegetaton that thrives on golf balls. Water hazards abound here. Aside from the knee-quaking effect they have all by themselves,, drainage designs tip the fairway slightly, just enough to encourage bounce-bounce, plop-plop. The area's flatter terrain plays tricks on depth perception for the first few rounds. Golfers tend to see short, and they hit short. Caution: New sand tends to be fluffy, a perfect medium for fried eggs. Area putting surfaces, with grainier grass, tend to be less smooth and require stronger strokes than those up North. More golf tips look at: Click here! Play online in AUGUSTA: Click here!